Ziamond Cubic Zirconia CZ Jewelers is proud to present the Kate Middleton Cubic Zirconia Round and Oval Man Made Sapphire Royal Bracelet. 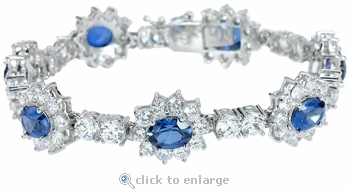 The Kate Middleton Royal Bracelet is royalty at its finest with approximately 21 carats in total carat weight. A true piece of elegance with its regal display of various sized rounds centered around 1 carat each oval basket set Ziamond cubic zirconia cz. The bracelet measures 7 inches in length and is secured with a single safety clasp. The oval center stone is available in various color stone options. See menu options.